Time to re-balance my ONcore Premier II TDA allocation? Time to rebalance your ONcore Premier II TDA allocation? How each of your individual investments contributed to your overall portfolio performance? How your current allocation compares to a Maximum APR allocation and a Risk-Reward balanced benchmark? Which investments have the least & most affect on your rate of return and the amount of price volatility to expect? Each TDA-Checkup analyzes your existing ONcore Premier II Savings Plan for a single historical time period of 3, 5 or 10 years. Advanced-Scan Checkups cover three different time periods giving you a more robust picture of how your investments have performed over time. Each report is customized so all the analysis and allocation information is specifically about your personal ONcore Premier IITDA. Ten years of software and database development allows you to quickly and easily evaluate different ways of distributing your dollars using the existing investments that make up your current retirement portfolio. The results are contained on just two actionable pages and include a color coded key to help you easily identify areas of concern and opportunity! 401k-Checkups™ do not predict the future, they re-shuffle the past by doing a stochastic modeling analysis of your specific portfolio. Now you can enjoy the benefits of advanced simulation modeling to examine a broad range of asset allocation possibilities to help with your decision making. 401k-Checkups™ are a tool to help you gain asset allocation insight and identify the strengths and weaknesses in your current 401k. Each report is an easy to understand tool with valuable information. Color-Coded Report in a Familiar Format Risk-Reward comparison with easy to understand numbers and picture. Quickly determine if you would have been able to Do Better with a different allocation. -Balanced(risk-reward) allocation. 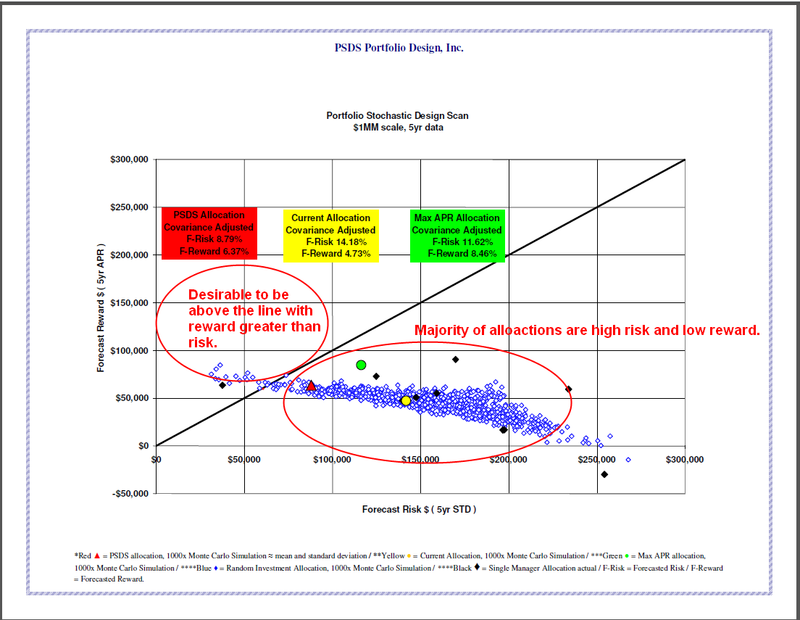 Confirm your design is performing as you intended -OR- Identify different allocation options for you to consider. Individual Asset Performance Each investment holding is shown to identify how it helps or hurts your overall portfolio return and risk. Easily identify investments to consider for receiving more or less of your savings. Choose between a 401k-Checkup or an Advanced Scan 401k-Checkup examines one time period. Advanced Scan examines three time periods. See how your investments behave differently over time for the most comprehensive analysis of your 401k plan. If you have any questions or have any other suggestions or ideas, please email to info@401k-checkup.com. We hope you make 401k-Checkup part of your re-balancing process whenever you review your portfolio. Save Time and “Do Better”!